Temporary & Electric Fencing Electric Fence Supplies Safety Use to temporarily turn off power to electric fence while making repairs, etc. Temporary & Electric Fencing Electric Fence Supplies Safety Use to switch the bottom wire off when grass and weeds make it hard to keep the fence "hot". Will limit the power drained on low wires, keeping upper wires hot. Returns to normal when short is reduced. Ideal for use near flood prone acreage. 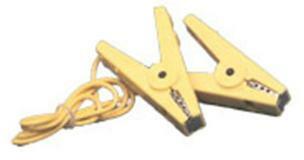 Temporary & Electric Fencing Electric Fence Supplies Safety Stainless Steel contacts and Wing Nuts. Use to temporarily turn off power to electric fence while making repairs.